Where Will Netflix Inc. Be in 5 Years? The company may become a sprawling entertainment giant in the far future -- but first, the streaming video expert needs to start making more cash than it is spending. So what about the next five years? 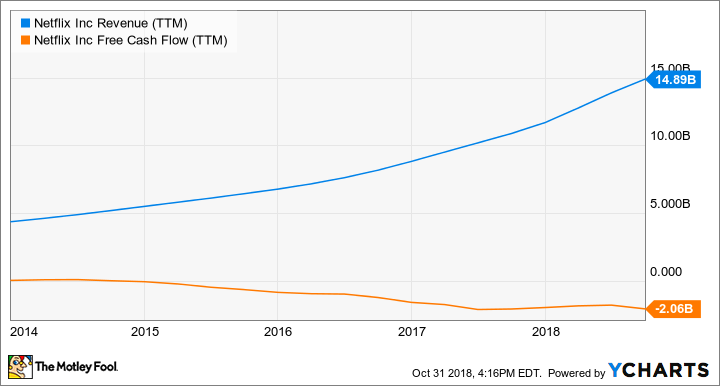 Well, I'm here to tell you that Netflix will have shifted into a very different business model in 2023 where all-out sales growth has been traded in for stronger profits and -- the real shocker -- positive cash flows. Netflix has consumed $2.1 billion of free cash over the last four quarters. Management expects the cash spending to ramp up significantly in the fourth quarter, raising the cash outflow to at least $3 billion and perhaps as much as $4 billion. The vast majority of those expenses stem from the company's ambitious content creation schedule. The idea is to spend big money on high-quality content now, then reap the rewards over many years as the resulting shows and films help Netflix attract and retain millions and millions of subscribers. This is a radical change from Netflix's original strategy, which was to essentially lease access to content made by other studios. The new plan of action cuts out the content-producing middleman to help Netflix control the costs of each new production and also maintain in-house control over the resulting media. Rather than paying for the same content over and over again, as each deal expires and needs to be renewed, Netflix becomes the owner of the original media. In the future (and in special markets such as China today), Netflix can even turn the licensing game on its head by selling its own shows to other networks. Syndication can be a powerful tool. Start paying big bucks out of pocket to create new shows and movies under the Netflix banner. Finance this enterprise mostly through billion-dollar loans along the way. See today's cash investments deliver a cash-making return in the form of many loyal subscribers. One day, declare that the cash machine Netflix built has outgrown the incoming cash bills, creating positive and growing cash flows for the long haul. One important step along that route is happening right now. Netflix expects to hold its negative cash flows steady between 2018 and 2019. In other words, we're right on the threshold of the bounce back to positive cash generation. Going from there to actual cash creation will not happen overnight, but I'd be shocked if it takes more than five years. Credit ratings giant Moody's agrees, basing a recent upgrade of Netflix's creditworthiness on the expectation of positive free cash flows in 2023 and beyond. I'm sure that Netflix will have tweaked its business in many other ways by that point, but delivering strong cash flows will be at the top of management's agenda. The company is well on its way to becoming a global conglomerate in the entertainment market, much like Walt Disney or Comcast. Like Comcast's NBCUniversal division and the House of Mouse, Netflix could expand into related sectors such as theme parks and hotel chains. The fledgling content studio may start producing shows for other platforms -- a common cross-branding strategy in the cable TV sector today. "Eric, you're using the word 'loss,' and I think you mean investment. We definitely hope that they're not turning into losses," Hastings said, in response to a question about the biggest "cash flow burn" investors should expect. "Our track record would show that those investments have turned out to be very successful for us."